SAN DIEGO – Thousands of jumbo flying squid — aggressive 5-foot-long sea monsters with razor-sharp beaks and toothy tentacles — have invaded the shallow waters off San Diego, spooking scuba divers and washing up dead on tourist-packed beaches. The carnivorous calamari, which can grow up to 100 pounds, came up from the depths last week and swarms of them roughed up unsuspecting divers. Some divers report tentacles enveloping their masks and yanking at their cameras and gear. Stories of too-close encounters with the alien-like cephalopods have chased many veteran divers out of the water and created a whirlwind of excitement among the rest, who are torn between their personal safety and the once-in-a-lifetime chance to swim with the deep-sea giants. 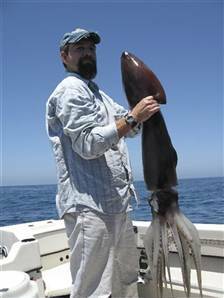 The so-called Humboldt squid are native to the deep waters off Mexico, where they have been known to attack humans and are nicknamed “red devils” for their rust-red coloring and mean streak. Those who dive with them there chum the water with bait and sometimes get in a metal cage or wear chain mail to avoid being lashed by tentacles. An MSN video about these squid can be found here.